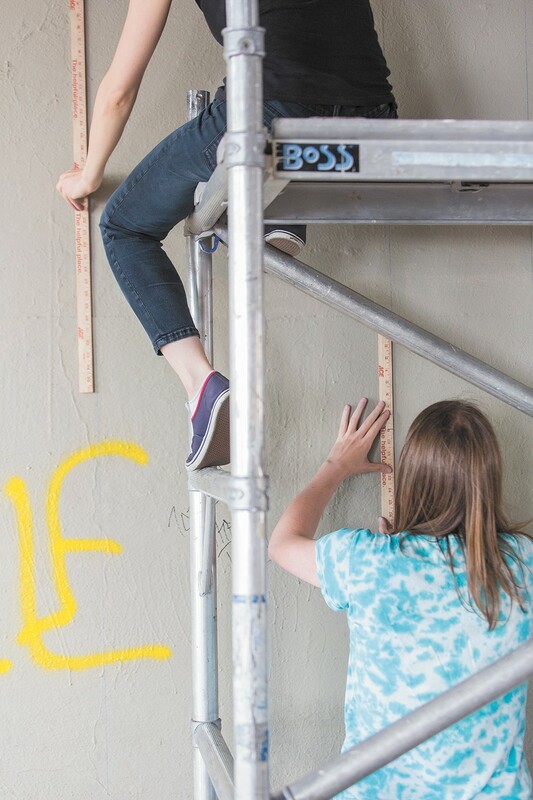 Ellen Picken (top) and Erin Mielcarek (bottom) begin work on their mural on Wall Street. Erin Mielcarek and Ellen Picken get a lot of visitors while they work. Most just want to know what the two are doing at the Wall Street underpass in downtown Spokane. This summer, they'll be giving the same answer to all of those curious passerby — they're painting a mural. 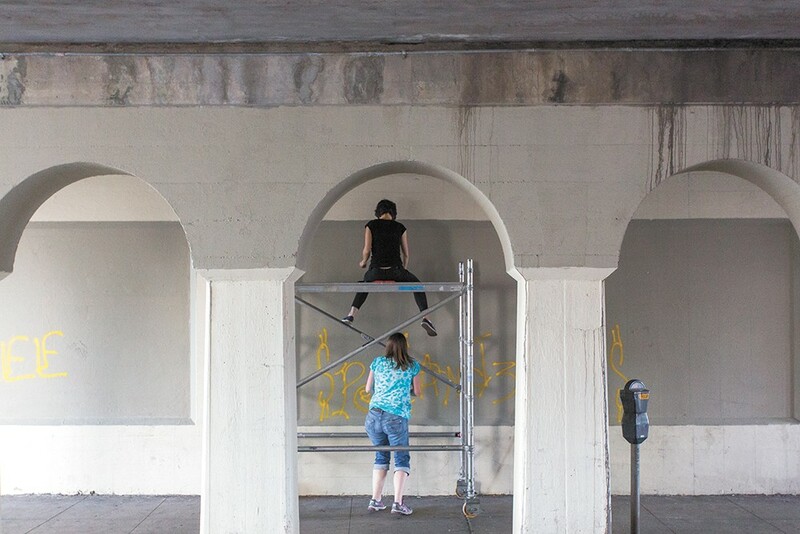 Mielcarek and Picken are one of four teams selected by the Spokane Arts Fund to paint murals on the walls of four selected underpasses in the downtown area. Many of these spots were home to murals that had fallen victim to time and the elements and needed something fresh, at least in the view of the nonprofit arts organization that receives funding from the city, Visit Spokane and other entities. By the end of August, the teams are to have completed their pieces, but on this first Monday of June, Mielcarek and Picken have yet to put any paint on the walls. They're sitting on scaffolding, sketching a massive grid on the wall as the first step of their conceptual mural, a brightly colored collection of lines meant to represent the trains that pass overhead. Other than the time Picken painted a forest on one whole wall of her bedroom at age 12, this is the first time either artist has created a full-sized mural. For beginners, they're hardly easing into it. Their ambitious plans include vibrant paintings on both sides of the underpass, as well as the pillars. The goal is to brighten the stretch of Wall Street that's currently anything but. Picken, originally from Spokane, has traveled around the world. Along the way, she's seen the impact of public art in places like Berlin. "In cities I've been to where the city doesn't fund the arts, people will still fill these open spaces with good or bad art," she says. "It can make a neighborhood better. That [Spokane Arts] is funding this makes me feel like there's a large part of the population that supports us and wants art here." Spokane is hardly the only city to invest in its walls. The Seattle Mural Project is set to begin work on four selected spaces after recently closing an online voting process. In Tacoma, the city's mural project has now completed more than 20 paintings and has repeatedly touted the murals as an example of how to deter tagging and graffiti. Studies have shown that vandals are much less likely to paint on a wall that already features a mural, and murals can cover up whatever half-assed spray-painting was there before. The Spokane Mural Project provides artists with all the supplies and paint (much of which is donated by supporters like Miller Paint), as well as a stipend of between $1,500 and $1,700, depending on the location. In addition to the Wall Street underpass, murals also are underway at underpasses at Maple Street, where Todd Benson is at work, and Cedar Street, where you'll find Eric-Alain Parker and Lisa Soranaka painting a piece focused on the city's love of the lilac. At Howard Street, the Spokane Urban Mural Artist Collaboration, including artists Tiffany Patterson and Jason Corcoran, aims to create something that includes some inspiration from kids who submitted pieces with their interpretation of "Near Nature, Near Perfect." SUMAC plans to begin painting in late July. Halberstadt also sees the program as a way for the public to see the community's artists at work. Those folks continually asking Mielcarek and Picken what they're doing? That's all part of the job. "It's very rare that you get to see that process out in the open like that. We encourage people to walk by and check it out. They're all friendly," says Halberstadt, who says the selection committee made it clear to applicants that interacting with the public was a requirement for the project. All of the murals will be created by Spokane artists and are Spokane-centric in their themes. For Parker and Soranaka, artists who met while in graduate school at Washington State University, that meant getting up close and personal with the lilac. Very up close. Parker says the piece, located at Cedar Street at the edge of Browne's Addition, encompassing both sides of the street and the pillars holding up the train trestle above, is meant to zoom in on a lilac and see everything going on beyond the reach of the naked eye. "Our approach was to defamiliarize something," he says. "We want people to see drama that would be microscopic. We'll have aphids chasing ladybugs, bees, hummingbirds — it's all small-scale stuff that's blown up." Parker graduated from Lewis and Clark High School before heading to Whitman College, then WSU. He's home for the summer, but will head to Fairbanks, Alaska, after he completes the mural to continue work on a creative writing MFA. For now, he's devoted to giving his hometown something it'll see for years to come. If you have ideas or opinions about what he and Soranaka are up to, by all means let him know, he says.